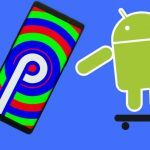 At Google I/O 2018, the tech-giant officially unveiled the next version of the Android mobile operating system — Android 9.0 or, for now, Android P. While we don’t yet know what the “P” will stand for (in keeping with Google’s tradition of naming the OS after sweet treats, some are guessing “pumpkin pie,” “parfait,” or “popsicle”), we can expect a proper name by the time company releases its stable version to the public later this year. Google has released the first beta tester build of Android P at Google I/O. The developer preview is available for everyone with a compatible device. Currently, Google’s very own Pixel series of smartphones and partnered devices from Xiaomi, Nokia, Oppo, Vivo, OnePlus, and Sony are eligible for getting the beta testing build of Android P.
Android P is going to bring a ton of new features to Android and is one of the biggest upgrades we’ve seen for the OS so far. Although there isn’t a drastic change in terms of visuals, there are still some considerable newer aspects to watch out for. Here are all the top features in Android P, which every Android enthusiast will like to know. Google is all set to ditch the traditional three-button navigation system and bring a gesture-based navigation system starting with Android P. However, users can still choose to enable the old three-button navigation system consisting of home, back, and recent apps. 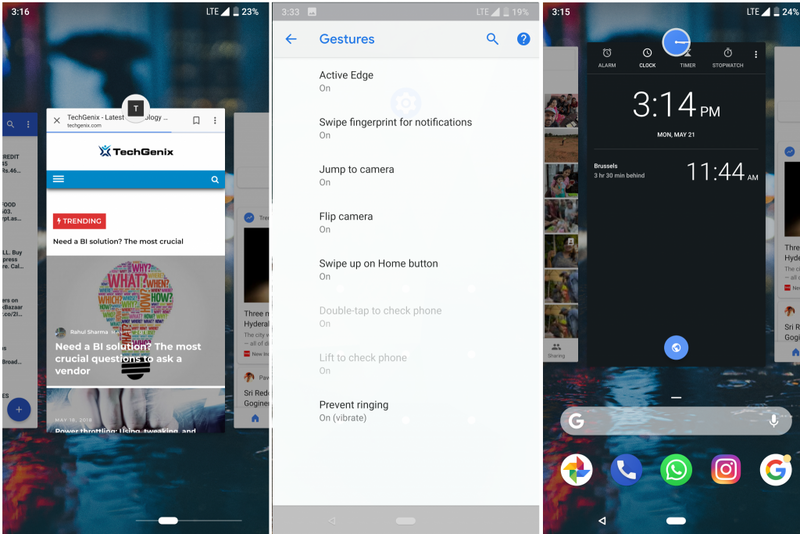 This is perhaps the biggest visual change in Android P and we felt that Google has taken a lot of cues from arch-rival Apple’s iPhone X in designing this gesture system. In this latest release, the three button navigation system is replaced by a single home button that allows you to navigate and use the device. The button still serves as a home button and can launch Google Assistant on long pressing it. 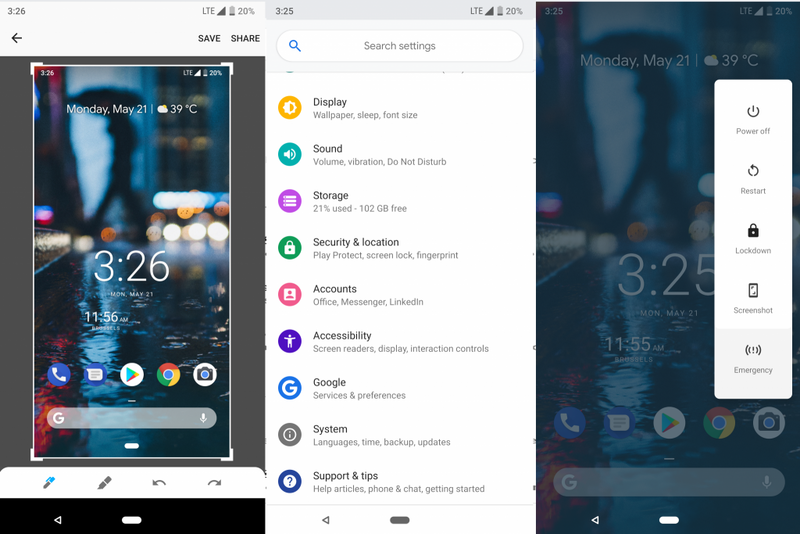 Swiping up the home button will bring up a new Overview screen, which is Android P’s replacement for the old recent apps screen. The overview screen consists of recent apps — five apps that the OS predicts that you might want to use. Swiping up twice or a long swipe up of the same button will land you in the app drawer. Swiping the home button left or right can aid you in navigating or switching between the recent apps. This is a very fluid, intuitive, and convenient way to navigate through all your open applications in the background and saves a lot of time in switching between apps. The back button, however, is not completely expelled from Android P. Having said that, the back button does appear when needed. 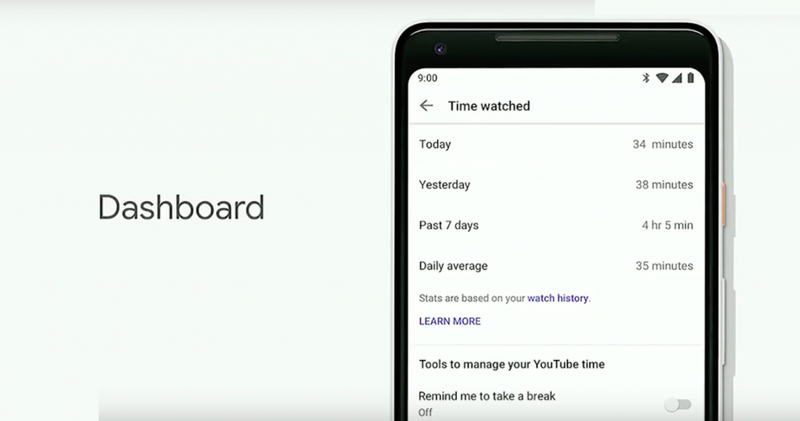 At I/O 2018, Google introduced an all-new feature called Android Dashboard. This dashboard has a “Digital Wellbeing” feature that shows how much time you are spending on your phone. The dashboard also displays the number of times you’ve unlocked your device, application usage times, and more. The dashboard also enables users to know exactly what they are spending their time on when they use the phone and also gives you the number of notifications received. Another interesting feature introduced by Google under Digital Wellbeing is App Timers. With Android P, users can set certain time limits on applications. After the limit is reached, the application icon will be grayed out for the rest of the day. This feature can, however, be enabled or disabled by the user. Shush mode is yet another interesting feature meant to avoid the visual distractions users face due to app notifications or alerts. Placing the phone with the screen down will automatically mute notifications. Wind Down mode is yet another intuitive feature of Android P in which a user first tells Google Assistant about sleep timings. The device will automatically go into do-not-disturb mode and the screen will gradually turn monochrome for reduced battery usage. At Google I/O, CEO Sundar Pichai said that the Android Dashboard and other features launched under the Digital Wellbeing initiative are meant to regulate user’s smartphone overuse so that they get more time to spend with people. With every new Android version, Google is trying hard to improve battery life in the devices. With Android P, Google is rolling out a new Adaptive Battery setting, which is meant to optimize battery consumption. Adaptive Battery mode in Android P targets idle battery management and ensures the battery doesn’t drain out when the phone is idle. All the applications in the phone can be grouped in a new mechanism known as “app stands buckets.” Grouping of the applications is to be done on the basis of their usage and frequency of use. Applications grouped in a higher-tier bucket will continue to use background data even when the phone is in standby mode. On the other hand, a lower-tier bucket’s applications will be restricted from using background data during standby. 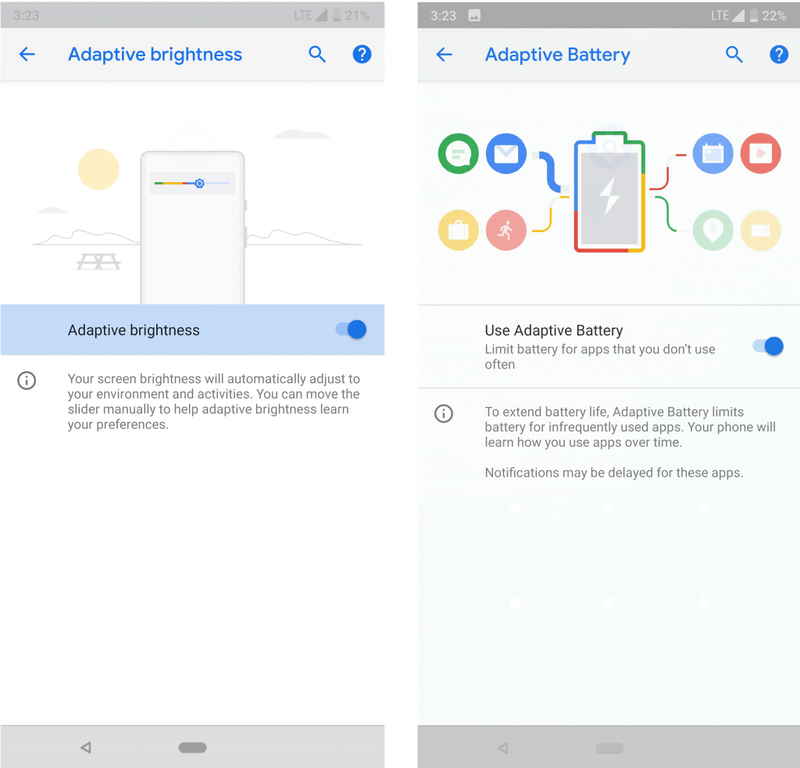 Google during the launch claimed that Adaptive Battery can save as much as 30 percent of the battery from being drained out when the phone is in standby mode. As mentioned earlier, Google is pushing machine learning and artificial intelligence into Android P for better performance and usability. Auto brightness is something we’ve all been seeing in our mobiles, but quite often we don’t use it and instead manually adjust the screen brightness. Adaptive brightness in Android P is planning to overcome this. Instead of solely relying on the light sensor embedded in the device for automatically setting up brightness, the OS will use machine learning techniques to adjust the brightness level based on how the user’s history. Although Android P doesn’t have any major design and visual modifications compared to the current Android Oreo, it does have few changes. Google has added some colors to the boring settings menu and has also added a bunch of new transition animations. Users will see newer transition animations while switching between the apps, multitasking, launching or closing applications, and more. Taking screenshots is now easier because users don’t have to fumble with pressing the combination of power button and volume rockers. With Android P, Google added the screenshot feature to the device’s power button. As soon as you press and hold the power button, a menu will pop up with the option to capture a screenshot. Also, with Android P, you’ll get a built-in screenshot editing option, which is very handy. Now that we’ve spoken about all the fancy stuff in the Android P, here comes the crucial part. How secure is Android P? With Android P, Google is all set to take a user security and privacy-related concerns seriously. With the increase in mobile malware and the growing number of attacks, mobiles are one of the easiest means of intrusion for cybercriminals. Here are all the security-related updates Google is rolling out with Android P.
As we all know, Android already supports call recording and there are tons of applications out there in the Play Store that can automatically record all or selected calls. The issue is, other users involved in the call never know that the call is being recorded, and this raises a serious security concern. Android P has an API that can automatically detect if a call is being recorded and gives an alert tone every 15 seconds alerting that the call being recorded or tapped. Almost all the latest Android smartphones are coming with a fingerprint scanner for biometric authentication. Google is rolling out Lockdown mode to temporarily disable biometric authentication for unlocking the phone. This feature can be very handy especially in the situation of distress. When the lockdown mode is enabled, the user will have to enter the PIN or password to unlock the phone and the biometrics will not be able to unlock the device. Often, users blindly grant permissions to apps while installing. If a user installs a malicious app on their device, previous versions of Android would not have been able to restrict the background usage of mic or camera once permission was granted. But with Android P, the background use of both the mic and camera will be restricted ensuring the privacy and security of the users. We often connect to public WiFi networks when at hotels, restaurants, parks, or shopping malls. These public networks can be an easy way for cybercriminals to intrude into your phone and steal or corrupt your data. With Android P, Google is working on protecting your device while it is connected to a network. 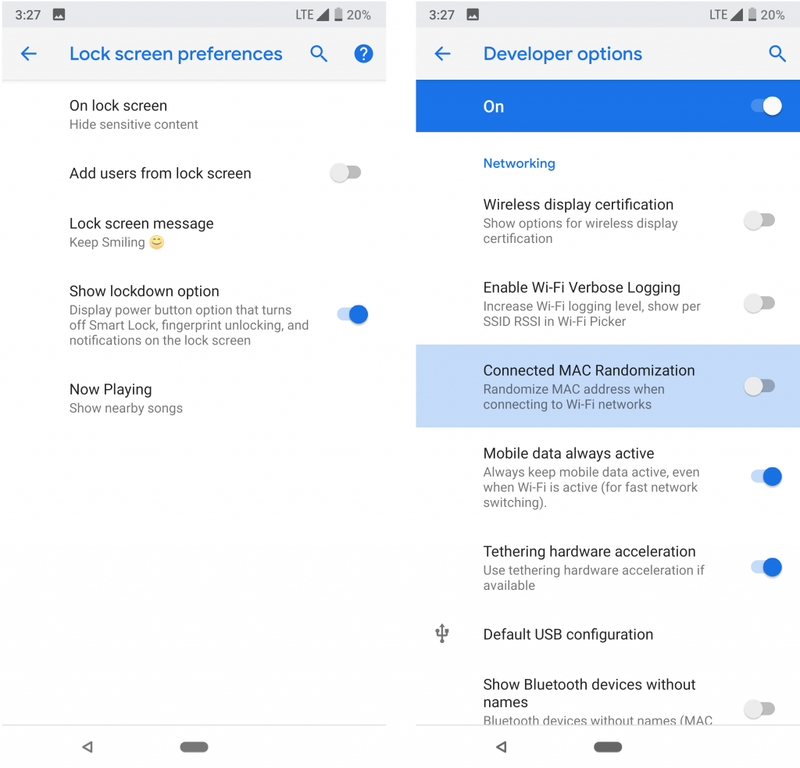 Android P will be featuring an additional security feature known as “MAC address randomization,” which will randomize your device’s MAC address every time it connects to a network. This will protect the device from being targeted or tracked by cybercriminals. Android P will curb the major security flaw of granting network tracking abilities to any app. Although the apps cannot access the content that is being sent or received over a network, they can still track the connections and the host’s details. Android P will restrict all network tracking abilities of applications that aren’t needed. There are a lot of other features in Android P that makes it a secure and productive OS in the Android lineup of operating systems. There are enhancements made in messaging, applications layout, look and feel of the OS, better notifications management, ambient battery indication, multi-camera support, and many more. Android P is currently still in beta and we already have a lot of interesting features packed in. We might see more features by the time Google releases the final public version of Android P. Considering all the features and improvements Google has packed into the new OS, it is evident that Android P is aimed at improving the overall experience for users while enhancing security and privacy. Well, you can actually get to use a device running on Android P, without spending a fortune. Pick any of the 'Android One' device, which will get the latest Android P for sure. The best part, they all are mostly priced under $250. Well done Sukesh, brilliant stuff and keep up the good work.